The Registered Financial Planner (RFP) programme was introduced and launched by the former Governor of Bank Negara Malaysia, Y.Bhg. Tan Sri Dato’ Sri Dr. Zeti Akhtar Aziz in November 2002. The RFP designation has been approved by the Bank Negara Malaysia in March 2005 as the qualification to apply for the Financial Advisers’ License and Financial Advisers’ Representative License under the Insurance Act 1996. The RFP designation has also been approved by the Securities Commission Malaysia in November 2005 as one of the qualification to apply for the Investment Advisers License under The Securities Industry Act 1983. RFP designation has also been duly approved by the Securities Commission Malaysia for the application of the Capital Markets Services License (CMSL) in view of the introduction of the Capital Markets and Services Act 2007. The RFP serves as a mechanism for the MFPC to help fulfill the National objectives of making Malaysia a Centre of Education Excellence. The RFP signifies the twin pillars of professionalism in financial planning – Professional Education and Practice Excellence. Most Importantly, the concept of the RFPs is defined by Malaysians who understand our values and needs. The RFP advantages: Malaysianised syllabus; high-quality study materials; excellent lecturers; greater flexibility in methods of study; reasonable programme fees; consumer-oriented; proactive and multifaceted, capable of providing quality planning. The designation, “Affiliate RFP” was introduced in September 2007. It was introduced in recognition of the commitment and diligent works of our students undertaking the RFP Programme as well as to foster a closer membership relation with our individual members. Recognized by Bank Negara Malaysia and Securities Commission – RFP designation is recognized by both regulators for the application of Financial Adviser (FA) License and Capital Markets Services License respectively. Branding of your Professional Image – MFPC is a Self Regulatory Organization (SRO), MFPC Membership enhances long term Public Image. Venturing into financial planning professio n– Affiliate RFP designation provides entry opportunities to professionals who wish to venture into the financial planning profession. Leadership Quality – Being a MFPC, you will be accorded a place among a group of pioneer RFPs, who are instrumental in the development of financial in Malaysia. Participation in Financial Planning Education and Advisory Services – RFPs are given priority to be Certified RFP Trainers; you are encouraged to actively participate in lecturing RFP Modules and conducting of seminars / talks on financial planning subjects. The MFPC strongly recommend RFPs to hold advisory positions in various boards and committees in the related industry via AKPK and local universities. 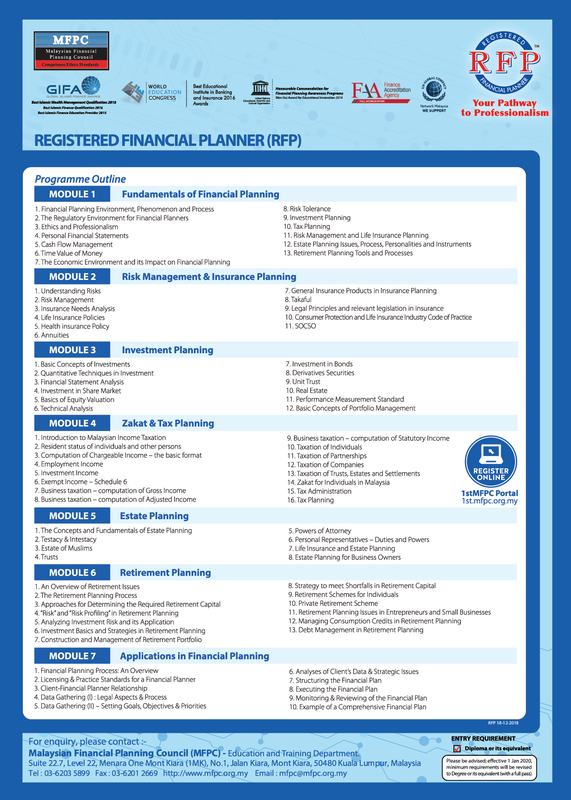 Professional Indemnity (PI) Insurance Scheme – Members of the MFPC have the unique privilege to be enrolled in the PI insurance Scheme especially tailored to the requirement of Bank Negara Malaysia. Financial 1st Magazine – Financial 1st Magazine published by the MFPC is exclusively free-of-charge to the Ordinary Members. A special membership discount of 10% is given to the Members who wish to advertise in the Financial. Priority and Special Offer to MFPC Members – MFPC Members are given special discounts and priority standing in all MFPC promotional and publicity activities via seminars, workshops, advertisement campaigns and conventions.